Shotoku has been around for quite some time, but for those who may not be familiar, can you explain who you are and what you do? We have been supplying manual studio pedestals, heads, and all sizes of cranes, since the launch of our broadcast division in the 1960s. As the division grew and our experience in all areas of studio production grew with it, we expanded into more advanced electronic-based systems. In 2005 we made the strategic decision to create a completely new, UK-based, broadcast robotics design and manufacturing facility as a wholly owned subsidiary of Shotoku Corporation. Shotoku UK is located in Staines in Southwest London. Since its inception, the UK office has added a number of management, operational and technical staff with decades of experience in high-performance broadcast robotics. Today, Shotoku is proud to support customers across the world with the highest level of technical performance and dedication to customer service that reflect the core values of the original company, founded over 50 years ago. What do you think is the most important thing the industry should know about your company? Well, a few things come to mind. First would be our long-standing commitment to the industry. Most would be surprised to learn that weve been supplying technologically superior, high performing and robust systems for more than 50 years. Second, the fact that we offer such a wide range of solutions to the broadcast industry is key. We have advanced technologies that target a variety of market segments from professional users, OB and studio production to fully robotic and VR live TV studios. We highlighted our full range of these solutions at this years IBC show. Third, I would say that we are a perfectly sized company small enough to give truly personal support and undertake product customisation, but large enough to support offices around the world able to address the needs of a global customer base. What do customers and potential customers seem to be most interested in when you are exhibiting at such shows as IBC? 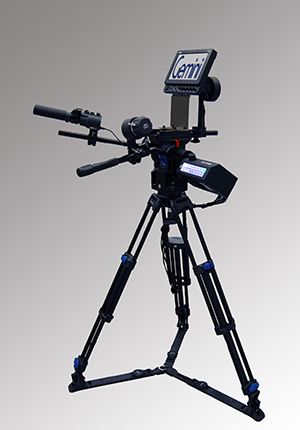 We have been leading the charge for years in providing advanced manual and robotic camera support systems, as well as virtual reality tracking solutions, to the broadcast market, and always look forward to reaching professionals worldwide and demonstrating how our product lines work and achieve results in real-world applications. Certainly, anyone walking through our stand at a tradeshow has his/her own unique needs. They are typically interested in things like the flexibility of our systems, ease of use, portability, return on investment, etc. In addition, they are often pleasantly surprised to see the wide range of camera support products we are able to offer even if not all are directly relevant to their particular current requirement, they like the fact that we can clearly support them over time even if their requirements develop into new areas. More specific, technical, questions could include things like, which lenses are compatible with Shotoku robotic systems, or which studio pedestals can the height drive be used with? Since you brought it up, what are the answers to those questions? Ha, well, virtually any ENG, teleconference or EFP / studio lens from any manufacturer can be used with the Shotoku robotic system. We offer several options when it comes to control interface: direct lens interface can be used with broadcast ENG, teleconference or EFP/studio uses. The Shotoku Lens Servo is great for broadcast ENG applications for ultimate high-end performance of zoom and focus, or situations where a 'Full-Servo' lens is not available. As for the Height drive, this is perfect for Shotokus TP-90, TP-80 or TP-200 and comes with a fully integrated mounting kit, but in fact the Ti-12 is compatible with virtually any suitably robust third-party studio pedestal its certainly not necessary to replace older pedestals. Which of your more recent products seem to be the most popular within the industry? We have a lot of products and solutions, but since we did just exhibit at IBC, I can say that we demonstrated a whole range of products at this years show, including control systems, parliamentary systems, pan & tilt heads, and a lot more. Our new Shotoku SX-300VR is an ergonomic, precision engineered, high resolution Virtual Tracking EFP pan & tilt head that offers uncompromised operation. This certainly got a lot of attention at this years show. Based on decades of extensive VR experience, the outstanding design features a robust and reliable platform for a wide range of camera and lens configurations. The SX-300VR provides high-accuracy, real-time data output with absolutely no loss in manual performance. 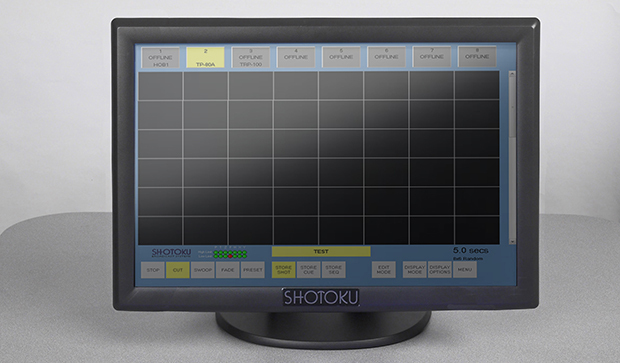 Like all Shotoku VR systems, the unit combines with the Serial Position Interface (SPI) for frame-synchronized high-resolution data tracking, compatible with all leading VR graphics systems. Our TR-T Control System and Orchestra CMS Parliamentary Systems are also very popular. Our TR-T Control System is an advanced control system that incorporates recent enhancements and expansions in terms of camera capacity and dynamic configuration. The systems we demonstrated were controlling multiple cameras and sharing camera operation across several controller-types. Our Orchestra CMS Parliamentary Systems are fully automated and feature live video touch-screen operation. The TG-27 pan & tilt head, becoming a standard among high-end parliaments and legislatures all over the world, was also highlighted. We find that customers are particularly interested in the way various products interact, working seamlessly with each other, and third-party systems, rather than any single product alone. No truly successful product is purely standalone its all about the system. Gemini Pan Bar Control System? How did IBC visitors react to it? The reaction to Gemini is always very positive it is one of the easiest systems to demonstrate, because customers instantly get it. And thats the whole point of Gemini; there is nothing more intuitive than controlling a camera (albeit far away from you) with a traditional manual pan and tilt head. The unique precision of the control provided by Shotoku is so good that an operator quickly forgets the remote position of the camera and gets on with capturing the action. What about the pan & tilt heads on the manual side? 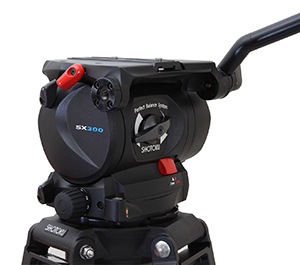 Certainly, one of Shotokus latest mid-weight EFP pan & tilt fluid heads is the SX-300, which features outstanding balance, a robust build and ergonomic design. With a high capacity 40kg (88 lbs) payload and wide-balance capability, the SX-300 supports an array of cameras, lenses and accessories, making it perfectly suited for field production, OB and studio use. The 300 head accommodates flat base or 150mm ball. Shotokus SG-900 manual pan & tilt head offers vibration-free speed in an ergonomically designed sturdy package. Ideal for OB and studio production with Teleprompters or box type lenses, the SG900 supports 90 kg (198 lbs), and features single knob balance adjustment. Whats are some good examples of the types of challenges your systems address? We work with all types of professionals in all types of applications. We recently worked with a DP and cameraman who owns and operates his own production company. He does most of the on-location shooting for his corporate client base himself and spends a lot of time running from one location to the next. He needed gear that was portable, easy to set up, break down and light enough to carry around with him from one job to the next. He shoots with the Panasonic AG-HPX500 P2 camera that was really just a bit too heavy for his last camera support system. He realized that he needed to come up with an alternative that would give him the workload he needed. So, for all of those reasons, he chose the Shotoku SP100 camera support system. He wasnt that familiar with our company, but because he spent some time with us at this years NAB, and remembered seeing our SP100 system, he came to us with his specific needs. The SP100 also fit nicely within his budget, so he purchased the system and was very quickly blown away with how simple and easy it is to use. It weighs 17 pounds but will hold up to 33 pounds. His camera is 18 pounds, so if he adds a battery, it still leaves him with around 10 pounds to spare. Its also an aluminium tripod thats lightweight, so its easy to open up, and allows him to set up on the spot. On a completely different level, we also worked with BBC Sport for its coverage of the All England Lawn Tennis Championships held this year. BBC Sport wanted to add an extra dimension to their flagship championship coverage in the form of Augmented Reality so two Shotoku TP-90/SX300VR tracking pedestal and head systems were installed within the relatively limited confines of the OB studio. With the time sensitive nature of an OB, and the normally lengthy processes associated with studio calibration for virtual or augmented broadcasts, delivering a polished result is always a challenge. Fortunately, Shotoku's quick and simple referencing system made rapid studio reconfiguration possible while providing high precision, easy to use, reliable equipment. Based on Shotoku's standard manual pedestals and fluid heads, only very minimal training was required for the camera operators who had no previous experiences of AR. Shotoku's solution was ideal for the project.